Ever since 1917, Passchendaele has been a byword for the horror of the Great War. In terms of lives lost in a single day, the failed attack on Bellevue Spur on 12 October was probably the greatest disaster in New Zealand’s history. 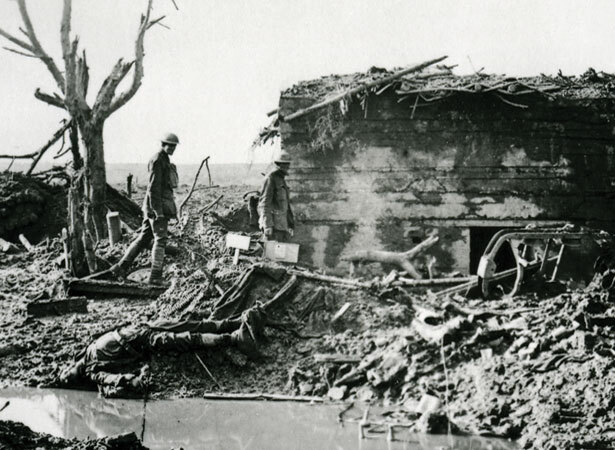 Eight days earlier, 320 New Zealanders died during the capture of Gravenstafel Spur, one of two spurs on the ridge above Passchendaele in Flanders, Belgium. Although this attack was successful, it had a tragic aftermath. The British High Command mistakenly concluded that the number of German casualties meant enemy resistance was faltering and resolved to make another push immediately. An attack on 9 October by British and Australian troops was to open the way for II ANZAC Corps to capture Passchendaele on the 12th. The plan failed. Without proper preparation and in the face of strong German resistance, the 9 October attack collapsed with heavy casualties. The New Zealanders nevertheless began their advance at 5.25 a.m. on the 12th. The preliminary artillery barrage had been largely ineffective because thick mud made it almost impossible to bring heavy guns forward, or to stabilise those that were in position. Exposed to raking German machine-gun fire from both the front and the flank, and unable to get through uncut barbed wire, the New Zealanders were pinned down in shell craters. Orders for another push at 3 p.m. were postponed and then cancelled. The troops eventually fell back to positions close to their start line. For badly wounded soldiers lying in the mud, the aftermath of the battle was a private hell; many died before rescuers could reach them. The toll was horrendous: 843 New Zealand soldiers were either dead or lying mortally wounded between the lines. We have 2 biographies, 7 articles, related to New Zealand's ‘blackest day’ at Passchendaele.